Cultural immersion - two weeks isn't long enough to really know a place, but it's a good amount of time to get a feel and cultivate deep appreciation and curiosity. It was a joy to wander through the city center of Regensburg and enjoy the energy, especially since the World Cup. I liked wandering through the local grocery stores, sitting in cafes, eating at different restaurants and enjoying a variety of foods - German, Italian, tapas, vegan burgers, gelato, Thai.....One evening a colleague and I headed out for dinner and ended up at the opera! A particular treat was the Fourth of July party at the University of Regensburg. I appreciated the thoughtfulness and the opportunity to meet new people. Current events - This seminar was an excellent example of how globalized the world is. I appreciated the context - from the German perspective - of issues related to the economy, politics, and social movements. Our country's inter-relatedness is undeniable. One of the most compelling topics, for me, is immigration. Since I live in a state that borders Mexico, the recent policies of the US Administration have had direct impact on people in my state and even students in my own classroom. Leaving the US in the third week of June, families seeking asylum through our southern border were separated and detained. It was interesting to learn about how Germany is dealing with the mass influx of immigrants and to hear about the political backlash that has ensued across Europe and in Germany. My awareness of Germany and Europe has been piqued, obviously, and so it was with a new perspective that I followed the news of President Trump's visit to Europe; comments about NATO, the EU, the UK, and Germany. I appreciate that I have a renewed critical lens with which to understand world events. Historical context - One particular experience that was illuminating was our visit to the Documentation Center Nazi Party Rally Grounds in Nuremberg. It was fascinating to learn about the rise of National Socialism beyond my learning in school. I found it to be rather bone-chilling, especially the emphasis on propaganda and the de-legitimization of the free press. Education and teaching - For decades, I've been aware of the vocational education programming in Germany and had awareness of kids being 'tracked' either to vocational ed or to college prep with limited context. What is most intriguing to me about the German education system is the idea that it's diverse and permeable. I encountered this ethos in Finland where their education system was described as having no dead ends. In both systems, there is not a singular path that students are destined to take. Gratitude - Finally, I am profoundly grateful for this incredible opportunity. Thank you, German-American Fulbright Commission, for the opportunity to experience German culture and an in-depth study of education in Germany. Thank you, University of Regensburg, for hosting this seminar and planning a relevant, joyful and compelling program. And, thanks to the teachers and students who spent time with us and welcomed us into their lovely schools. According to the United States Census Bureau, there are nearly 50 million people in the United States who describe themselves as being of German descent, making this the largest ancestry group in the country. Take a look at the map from 2000. Most states, including my own, includes people with German backgrounds. PBS offers this resource about German immigrants to the US between 1820 - 1924. The Library of Congress offers a lesson plan, "German Immigrants: Their Contributions to the Upper Midwest" that examines why Germans immigrated to the Upper Midwest and the impact they had on communities. 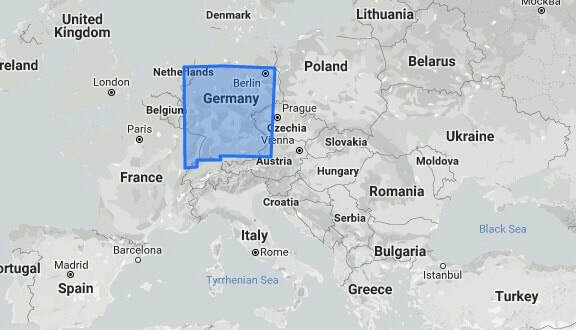 Geography - My state of New Mexico and Germany are almost the same size. Yet, Germany has a population of around 83 million and a little over 2 million people live in New Mexico. Consider the population density of each of these locations! Germany is the largest economy in Europe, is the second most populated country in Europe, and is the 7th largest in land mass. Include Germany in the study of the European continent with this lesson activity from National Geographic Education. 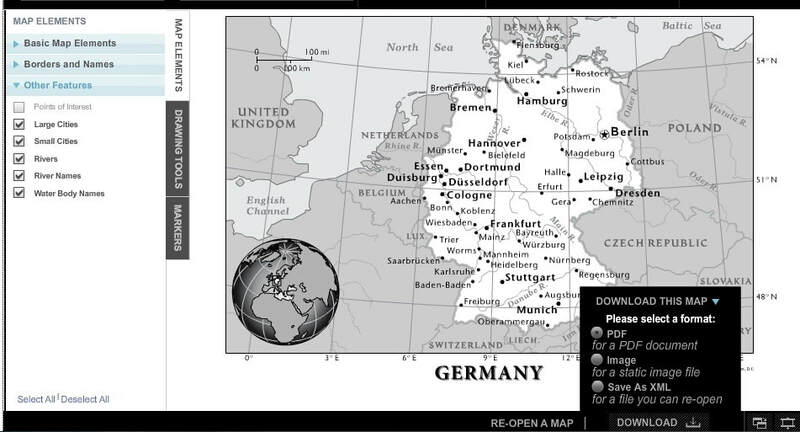 Create custom maps of Germany using National Geographic MapMaker. I had the pleasure of being in Germany during the 2018 World Cup (sorry that Germany exited with their loss to Korea on June 27.) I don't know about you, but my students love fùtbol! Here's a post by an educator about bringing the World Cup into the classroom! The beautiful cit of Regensberg is a UNESCO World Heritage site, and there are many others across Germany. National Geographic Education has a wonderful activity, Mapping World Heritage.